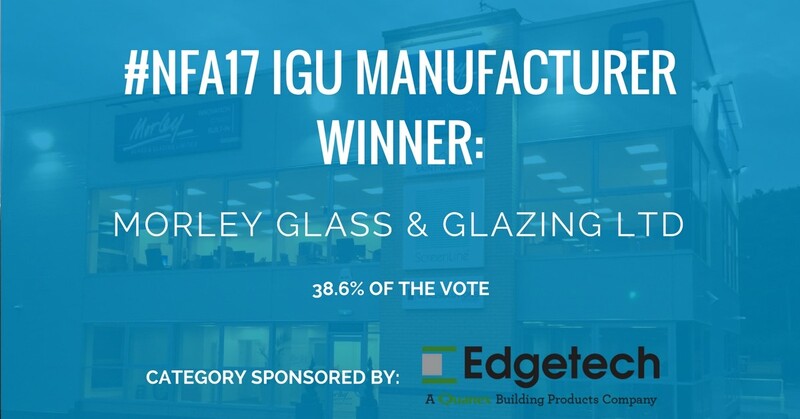 Won by Clayton Glass for the second time last year, the IGU sector within the UK glazing market remains one of the most competitive and forward thinking parts of our market. The IGU sector, alongside the spacer bar sector, has been one of the biggest drivers of energy efficiency in our industry. Each year U-Values continue to be pushed lower and lower, as we seek to improve our overall offering to home owners. Be it double, or triple glazed units, the IGU part of our market is a fundamental and diverse cog in the overall machine. There are some seriously hard working companies doing great things in this part of UK fenestration, which is why each year we dedicate a category to this very important part of our industry. To cast your vote, simply fill in the form below. We have worked to make the voting process as quick and simple as possible. It should only take you a minute. Each person can cast one vote in each of the 17 #NFA17 categories. Once you have filled out your vote click the “submit” button and that’s it. You’ve played your part in helping to decide UK fenestration’s best IGU manufacturer. The IGU manufacturer with the most votes by Thursday 30th November will be declared the #NFA17 winner of their category. To help you decide where to place your votes, each company will have the chance to set up their own profile page. These will become live once we receive then information requested from them and you’ll be able to click the name of each nominee to view their profile page.